Top your favorite treats with this easy to make caramel buttercream. Just imagine all of the cakes, cupcakes and cookies it could go on! 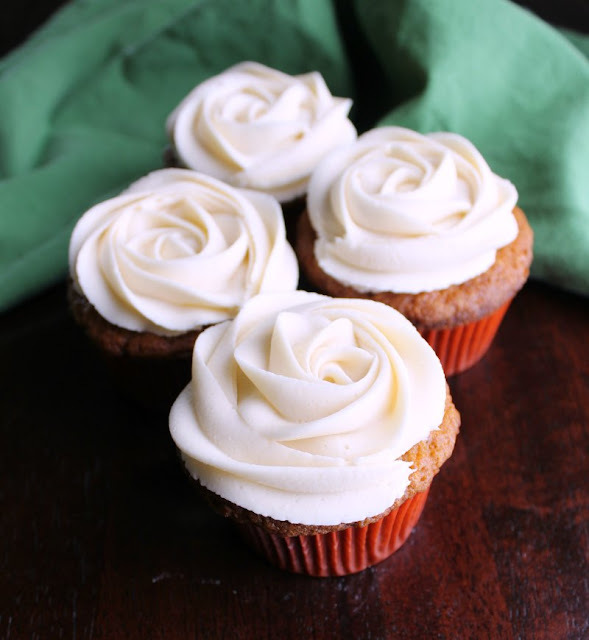 Sweet caramel goodness in a super delicious buttercream. 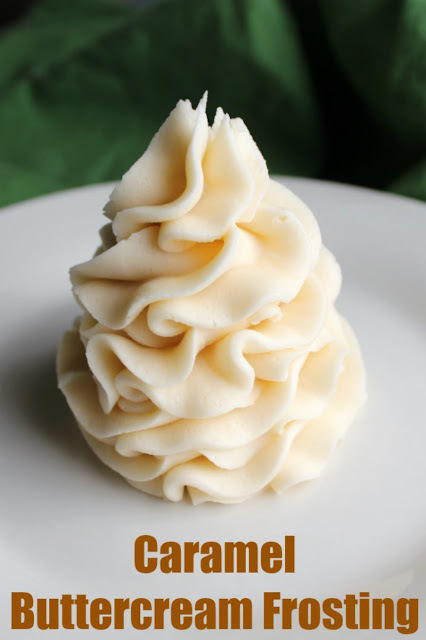 This recipe whips up in minutes and is perfect for piping and decorating. It holds its shape and tastes delicious! It is the perfect topping to any desserts that could benefit from a touch of caramel goodness. This week is going to be a fun one. This frosting is just the start of something scrumptious. The next few days are going to build to something fun for your Easter table. 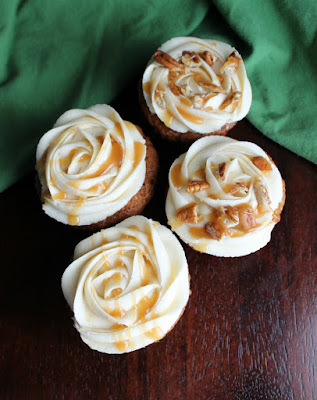 It started with the want to make some carrot cake cupcakes. Don't worry, I'm sharing the recipe tomorrow. Those cupcakes would of course need some frosting. I usually top my carrot cakes with cream cheese frosting. 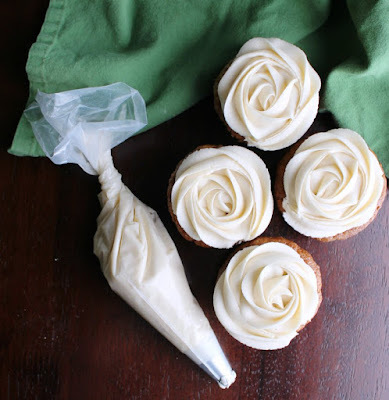 Sometimes, when I'm feeling spunky, I go with maple cream cheese frosting. It is super delicious and adds a little warmth to the mix. This particular day and for this particular project, cream cheese frosting just wasn't going to work. I needed something that didn't need refrigeration and something that would hold it's shape. 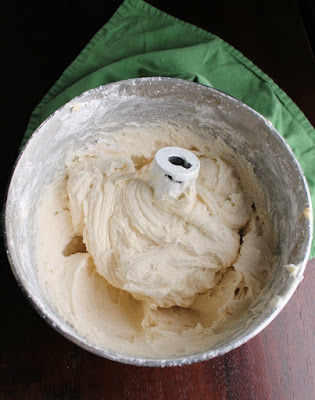 It was tempting to go to my old standby, sweetened condensed milk buttercream. It was really superdy duper tempting. But I like trying new things, so I figured I had better do something different. Boy am I ever glad I did. I had a bit of caramel sauce that was calling my name. I figured it would be an easy way to add flavor and warmth to the frosting. The final result was lip smacking (and finger licking) good. The final color was just golden enough to give a hint of the caramel inside. It piped beautifully on the cupcakes and was perfect on its own. They were also great with a smattering of chopped pecans and a drizzle of caramel. I cannot wait to let this project unfold for you. I hope you'll follow along. In the meantime, what kind of treat would you but this frosting on first? Beat butter until soft and fluffy. Add vanilla, caramel topping, and salt. Add desired amount of cream. Adjust the final consistency by adding a little more cream or powdered sugar. This looks like heaven! I wanted to stick my finger right down in the bowl for a taste!!! Can’t wait for the cupcake recipe! Have a great Monday sweet friend! I should make you some for your birthday! Caramel buttercream is the best! And yours looks PERFECT! Hi Carlee, being short on time I didn't know which recipe I was going to pop by and read, until I saw the word caramel! 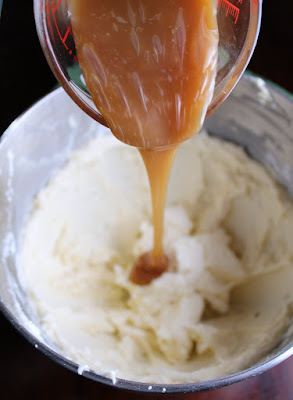 Caramel frosting, a treat for cakes! What do you call caramel topping? Would caramelized condensed milk work? We can get a thick caramel sauce in a jar for ice cream topping here. Carmelized condensed milk should work fine! I think the first thing I would put this on is a spoon!!! Sounds absolutely delicious! Hello! I'm from Mexico, and I was reading the receipe and suddenly read "cream", here in Mexico we have diffent types of cream, but I don't know if it's the same cream that we use here, or should I use milk, or maybe cream cheese?... please! can you help me? I used heavy whipping cream, but milk or half and half would work too. I hope you love it!